On Friday 30 November, the festive opening celebration of HollandPTC will take place in the Prinsenhof museum in Delft. Recently patients are being treated with proton therapy, a new form of radiotherapy against cancer for the Netherlands, in the outpatient centre HollandPTC located on the campus of the TU Delft. Parallel to these treatments, TU Delft is working together in HollandPTC with the LUMC and Erasmus MC medical centres on innovations in the care of cancer patients. Treatment, education and research go hand in hand to achieve better and responsible care. 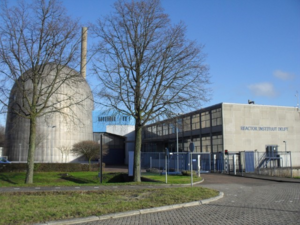 The permit design and the Environmental Impact Assessment for a cold source next to the core of the research reactor are open for public consultation from 22 November 2018 until 2 January 2019. Scientists have demonstrated that the positrons produced by the TU Delft research reactor are ideally suited for studying quantum dots, the building blocks of next generation solar cells. Magnetic skyrmions are magnetic swirls that have the potential to revolutionize information technology, since they may lead to new solutions combining low-energy consumption with high-speed computational power and high-density data storage. A team from Delft University of Technology, in collaboration with the University of Groningen and Hiroshima University, has now discovered a new, unexpected magnetic state, which is related to these skyrmions. The findings open up new ways to create and manipulate complex magnetic structures in view of future IT applications. Delft Bioengineering Institute has awarded Zoltán Perkό and Albert van de Wiel with a total of €7500 for the execution of three interdisciplinary MSc projects. Together with Elizabeth Carroll (ImPhys), Zoltan has designed a project that looks into ultrahigh dose-rate FLASH irradiation in zebrafish. With 3mE’s Giulia Giordano, Zoltan will look into using mathematical methods to optimize control of combined chemo-radiation therapy. Albert teams up with CEG’s Doris van Halem to measure arsenic content of rice products and waste water. In total, Bioengineering has granted 15 MSc projects that resulted from the networking event BioDate 2018. Below you read more about this three interesting projects. The permit application and the Environmental Impact Assessment for the cold source of the OYSTER-programme are available for consultation from 23 August to 3 October 2018. The application concerns the installation of a cold neutron source next to the reactor core. This cold source, which is in itself not a radioactive application, makes it possible to slow down the neutrons of the research reactor, thus allowing better research results to be obtained. NWO has announced the Veni recipients for 2018. Among them are seven Delft scientists, two of whom are from RST: Jeremy Brown and Zoltán Perkó. The Veni grants allow researchers who have recently obtained their PhD to conduct independent research and develop their ideas for a period of three years. Zoltán Perkó (Radiation, Science & Technology), together with Mischa Hoogeman (project leader, Erasmus MC) and Martijn Eenink (Holland Protonen Therapie Centrum) have been granted a KWF research project named PEARL (PrEcision of proton therapy increased by Advanced Robustness analysis). The OYSTER programme (Optimized Yield - for Science, Technology and Education - of Radiation) will enable educational, scientific and societal challenges in the fields of materials, health and energy to be better addressed. Between 21 May and 1 June 2018 RID hosted the first ‘Joint Purdue University – TU Delft Data Mining in Engineering Summer School’.